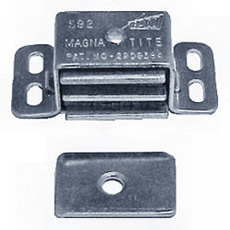 Heavy duty magnetic catch for larger cabinet doors with aluminum finish. Ideal for institutional and commercial cabinets. Aluminum case is self-aligning to the strike plate. Comes with strike. Magnetic catch for double cabinet doors or larger single cabinet doors - steel case with black zinc finish. Polybagged with strikes and mounting screws. Round magnetic catch with aluminum finish - press fits into a 5/8" bore. Aluminum case is self-aligning to the strike plate. Polybagged with strike and mounting screws.